It's been coming for a fair while, but with the final residents now evicted from the Heygate Estate, and property behemoth Lend Lease submitting a detailed planning application for the first phase of the proposed £1.5 billion 'regeneration' of the site, the time has come to admit that the iconic 1970s estate near Elephant and Castle is not long for this world. 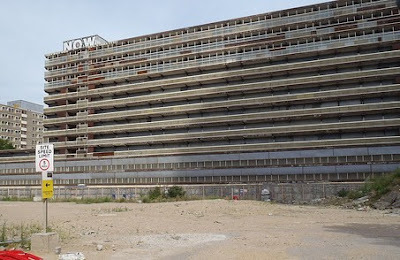 Built in the 1970s, the Estate was once home to more than 3,000 people but in 2004 a regeneration plan for the area around the Elephant and Castle brought forward the seemingly-inevitable. Though a tiny number of residents have previously refused to leave the estate, and have vowed to fight the compulsory purchase order for the site, it seems unlikely that they will win. Your author has always been rather a fan of the brutal grey Estate, but then again he never had to live there and barely knew it when it was fully operational. Perhaps it is for the best, but for the past few years it has seemed a bit sad to see it standing empty.